Do note that seating at Lickety Ice Cream & Waffles is limited as there are only two tables with seats inside and outside the cafe. You can enjoy their egglet waffles in two ways—Buttermilk and Red Velvet. Thereafter, choose from a selection of ice cream flavours such as Lingonberry Swirl and Hazelnut Rocher to enjoy with your waffle. Toppings you can pick from include crushed Oreo cookies and marshmallows. 1 scoop of ice cream with 1 topping and a waffle would cost you S$8.90 and 2 scoops, 2 toppings and a waffle would amount to S$11.90. 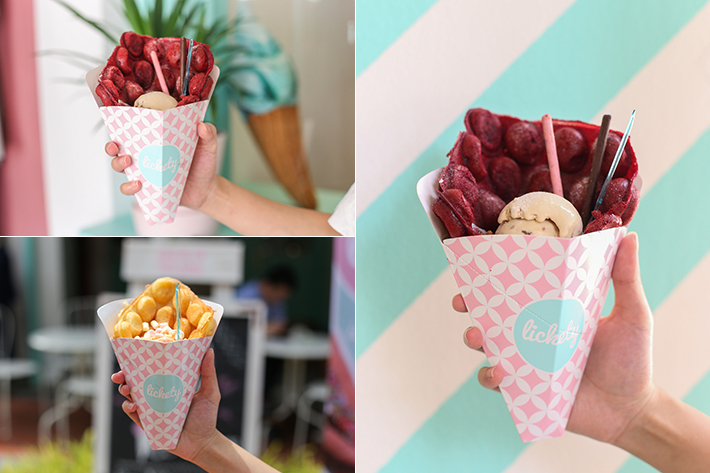 All waffles come in a paper cup which makes it a convenient treat to have during your exploration of Haji Lane or even just to eat at the cafe. 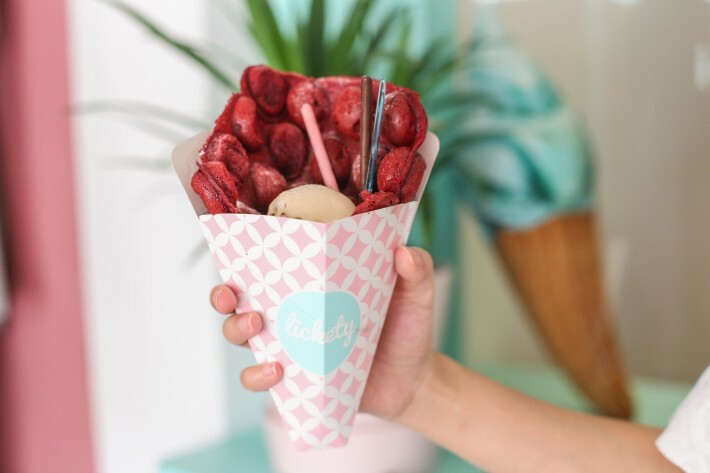 We ordered the Red Velvet Waffle with a scoop of Hazelnut Rocher ice cream and Pocky sticks (S$8.90). Aside from being an extremely pretty dessert, it was a pity that the waffle was not as crispy or “airy” as most egglet waffles usually are. Instead, it had a spongy texture similar to a regular waffle. Another thing that would have enhanced this dessert is if the red velvet taste of the waffle was not as muted. We also tried the Buttermilk Waffle with one scoop of Thai Milk Tea ice cream and mini marshmallows (S$8.90). Just like the Red Velvet Waffle, the Buttermilk Waffle had a spongy texture but it fared slightly better. 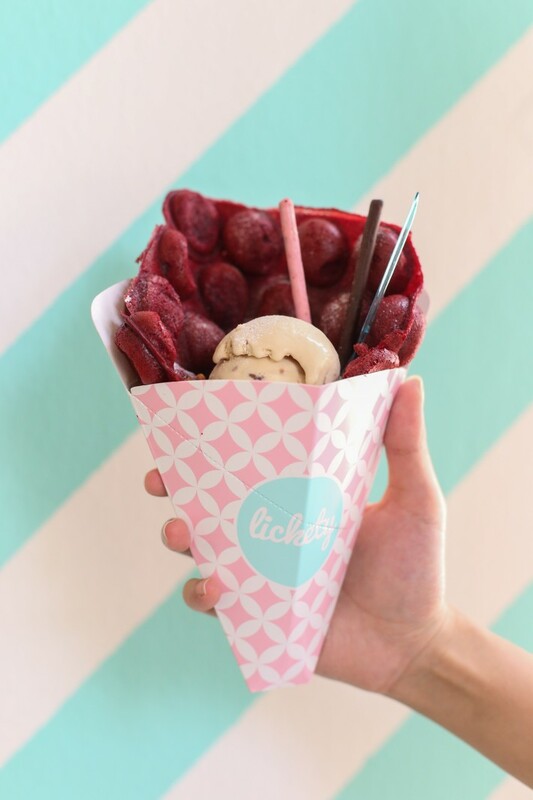 For those of you who are familiar with the famous Oddies Foodies in Hong Kong, you might find that Lickety Ice Cream & Waffles has a rather similar concept. Lickety’s assembly of the dessert sure strikes a resemblance to the iconic Hong Kong dessert, except that Oddies Foodies’ version is a lot better. But since nothing else in Singapore comes close, we’ll do with Lickety’s version whenever we have a hankering for some egglet waffle dessert.